This is a delightful Italian Christmas story about an eccentric old woman and her never-ending search for the Baby King. The twelve days of Christmas begin on Christmas Day and end on January 6, which is called the Day of Three Kings or Feast of Epiphany. Befana, an old woman is said to bring gifts to children, hoping that one of them is the child king that she refused to acknowledge years ago. As the legend goes, Befana lived near Bethlehem. One night while preparing her supper of beans and bread, she heard a knock at the door. Before her stood the three kings in search of the Christ child. They asked Befana if she knew where He could be found. "I know of no king," she told them and quickly shut the door. As time passed, Befana kept thinking about the strange visitors and their quest to find the Christ child. So, with a sack filled with bread, she set out on her own in hopes of finding the child king. Every time she saw a baby boy, she broke off a crust of bread and gave it to the child, hoping that he might be the Child. According to the legend, Befana is still wandering the towns and villages looking for the Christ child. Every year on the Feast of the Three Kings, the children of Italy await the arrival of Befana, who still leaves each child a small gift. 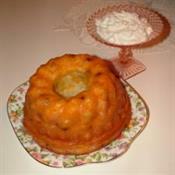 Befana Cake is traditionally made for the Feast of the Three Kings. Before the cake is baked, a large dried bean is added to the dough. the bean is king (or queen) for the day. Put the raisins in a bowl, cover with warm water and set aside. In another bowl, combine the candied lemon and orange peels and 1/4 cup brandy or liqueur and set aside. In another bowl, dissolve the yeast in 1/2 cup of warm water. Add 1 cup of flour and mix until a sponge dough is formed. Cover the bowl with plastic wrap. Let the sponge dough rise in a warm place for about 20 minutes. With an electric mixer, combine 4 cups of flour, sugar, salt, and lemon zest. Add the butter, eggs, and milk. Blend to form a stiff dough. Add the risen sponge dough and beat until well combined. Turn the dough onto a lightly floured surface and knead a few minutes and smooth. Grease a large bowl, place the dough in and turn it once to coat both sides. Cover with a towel and let rise in a warm place for 1 hour or until doubled in size. Butter a 10 x 3- inch deep round cake pan. Drain the raisins and candied citrus peels, reserving the brandy. Punch down the dough. Turn the dough onto a lightly floured surface. Pat the dough into a large rectangle. 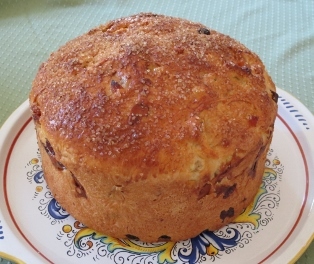 Sprinkle the raisins, candied peels, almonds and dried bean over the dough. Form the dough into a ball and knead to distribute the fruits and nuts. Place the dough in the cake pan, cover with a towel. Let the dough rise in a warm place for 1 hour, or until doubled in size. In a small bowl, combine the egg yolk, and 1 tablespoon brandy. Brush the top of the cake with this mixture and sprinkle with the coarse sugar. Bake 45 minutes until golden brown. Let the cake cool in the pan for 10 minutes. Run a knife around the side of the pan to loosen the cake and turn it onto a rack to cool. To serve, cut in wedges. Be sure to tell those eating the cake that there is a large bean in someone's slice, so that no one bites into it. To freeze, wrap in aluminum foil and freeze for up to a month. Active Yeast has coarse granules that should be dissolved in a warm liquid to 'bloom' or activate and get foamy; adding a pinch of sugar with the yeast encourages the blooming process. This takes about 5 to 10 minutes. Instant Yeast includes bread-machine, rapid-rise and quick rise yeast. They're finer in texture and can be added directly to dry ingredients; no blooming is necessary. Many promise a shorter rising time but that isn't necessarily a good thing because dough develops flavor and texture as it rises. Candied orange peel is an ingredient in many Italian desserts. It may be available in local markets during the holiday season but can be difficult to find troughout the rest of the year.